Following a week-long run at the Etcetera Theatre, Nomads of Bazar are transferring Jean Genet’s classic, The Maids, to the Greenwich Playhouse. The play was last performed in Greenwich* in 1974 and starred Glenda Jackson, Susannah York and Vivien Merchant, who all went on to act in the successful film of the same name. Loosely based on the infamous Papin sisters, who brutally murdered their employer and her daughter, Nomads of Bazar’s take on The Maids is staged as a truly modern tale of the beautiful and the damned. Fusing pop culture and our obsession with the media in the 21st century, The Maids challenges the boundaries between love, sexuality and criminal intent. The Maids stars Emilija Ellen (Blind Fate) as Solange, the eldest sister and driving force in the plot to kill Madame. The bolshie and extravagant employer, Madame is played by Claire Spence (Primeval, Doctors). Completing the line up is Irena Grgona (Bad Cake) who plays younger sister Claire; sensitive, slightly unhinged and easily led by Solange…or so it seems. Directing the cast is Gael Colin (Dangerous Corner, Much Ado About Nothing). 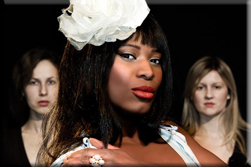 The Maids is on from 9 June to 5 July, 8pm at Greenwich Playhouse.